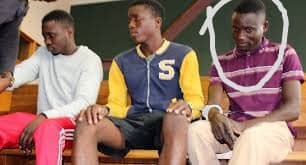 Pictured: Stefanus Daniel Nghilifa (circled) is still a fugitive from the Namibian Police. Six days after their daring escape from police custody in Swakopmund, three of the four murder accused fugitives were rearrested in the Oshihedi Sheengombe Village near Ondjiva in Angola. According to Erongo Regional Crime Investigations Coordinator, Deputy Commissioner Erastus Iikuyu, Fabian Tangeniomwene Lazarus, Matheus Nujoma, also known as Zaza, and Ngenokesho Stefanus were arrested in Angola on Sunday. Deputy Commissioner Iikuyu said the forth escapee, Stefanus Daniel Nghilifa, is still on the run. The fugitive Nghilifa along with Fabian Lazarus and Jerobiam Simon Shidute, are accused of strangling and bludgeoning the 78-year-old Roswietha Strzelecki to death in her home in Swakopmund during early August 2017. Her husband Siegfried Strzelecki who was 82 at the time, died in hospital due to serious injuries he sustained during the brutal attack. 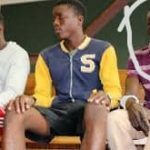 The two other prisoners that were rearrested in southern Angola, Matias and Ngenokesho are accused of stabbing a man to death at a club in the Kuisebmond neighbourhood of Walvis Bay during 2016. The four dangerous murder accused inmates managed to escape from lawful custody during a shift change at the Swakopmund Police Station last Monday.